Gallus gallus, sometimes G. gallus domesticus is a domesticated fowl descended from the wild Indian and southeast Asian red junglefowl (Gallus gallus) and the related grey junglefowl (G. sonneratii). 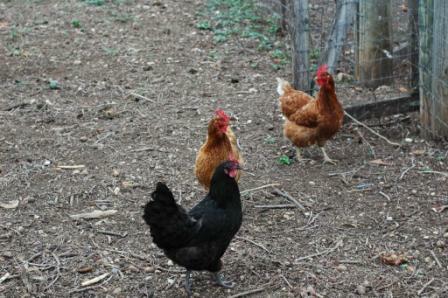 In the U.S.A., Canada and Australia, adult male chickens are known as roosters; Males under a year old are cockerels. Castrated roosters are called capons (though both surgical and chemical castration are now illegal in some parts of the world). Females over a year old are known as hens, and younger females are pullets. In Australia and New Zealand (also sometimes in Britain), there is a useful generic term chook (rhymes with "book") to describe all ages and both genders. Babies are called chicks, and the meat is called chicken. "Chicken" was originally the word only for chicks, and the species as a whole was then called domestic fowl, or just fowl. Chickens can make good companion animals and can be tamed by hand feeding, but — roosters, particularly — can sometimes become aggressive. Some have advised against keeping them around very young children. Chickens are generally low-maintenance. The major challenge is protecting the birds from predators such as dogs, raccoons and foxes. A bird left out at night is likely to be killed by a predator. Chickens are usually kept in a roost at night and a pen in the day (unless they are free-range). The floor is covered with bedding such as straw or wood shavings, which, with the high-nitrogen droppings, can go into a compost pile. Compost used on the floor is even better. 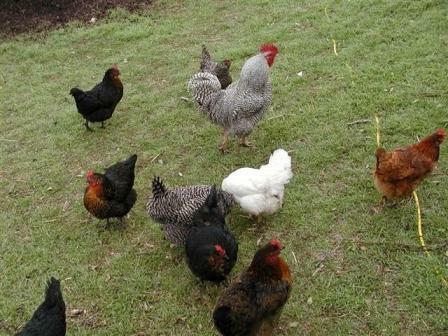 Raising chickens is a great idea because the eggs from birds that are eating a natural diet of bugs, manure, weeds, etc. are for more nutrious and healththy that the factory farm production eggs.